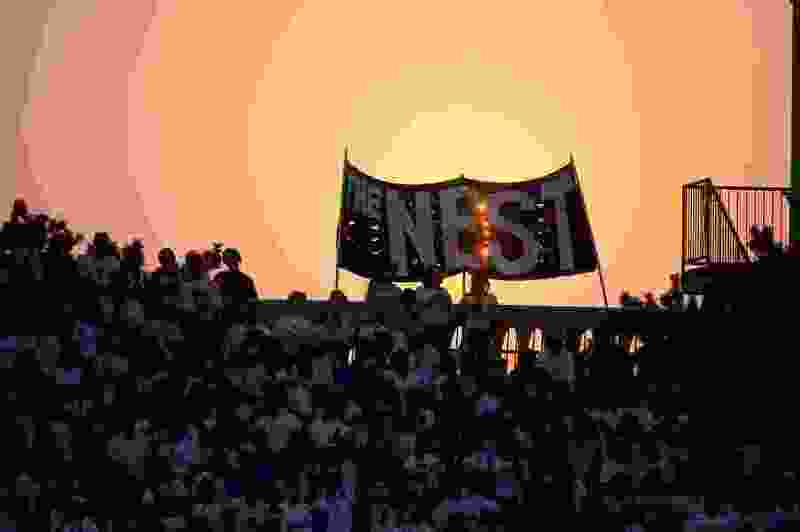 Francisco Kjolseth | The Salt Lake Tribune Skyline fans make up "The Nest" as they watch their team battle Hurricane for their season opener on Thursday, Aug. 20, 2015. As we were walking down the hallway during our first week at Skyline High School on a warm fall day, our eyes met a surprising sight — a teacher carrying a bucket of water to her classroom for the swamp cooler. The weather cooled and we got busy with our classes. Then one winter day we saw a line of garbage cans in the hallway, strategically placed to catch water dripping from a leaky roof. A recent commentary in The Tribune described how rebuilding Skyline High School would be demolishing a Millcreek landmark in the name of a 21stcentury education. A school is a place for learning that should meet the needs of its student body. It is not a museum! To refurbish Skyline High to be a 21st century school would cost more than it would to rebuild it. Skyline was built on a California design.The roof has leaked water since it was built as it was not designed for snow. Classrooms still have original carpets on the walls from 1962, an un-hygienic leftover. The forced air conditioning and heating unit disproportionately cools and heats the periphery classrooms but leaves the central and east classrooms to the environment, cold in winter and hot in early summer and fall. If we rebuild Skyline, the administration would no longer have to worry about placing garbage cans in the hallways to collect water that seeps into the school from snow melt. Teachers would no longer need to carry buckets of water for their swamp coolers to fight the sweltering heat. Students would no longer have to attend classes where they are unable to augment their education because of poor internet connection and very few electrical outlets. In a world where education is becoming more technologically reliant, Skyline classrooms are inadequate to provide an education in the Digital Age. Skyline classrooms have at most two wall outlets to plug in electronic devices for recharging. As a result, students are unable to use laptops or other devices to supplement traditional classroom learning. We live in a seismically active zone. We need a building that meets the safety requirements. In the past 60 years, building technology has improved and building codes have changed. Therefore, we now need to provide students a safe place to learn that can withstand a seismic event. In times of emergency a school can provide shelter to the community as a whole as well. We need a safe gathering place. 21stCentury schools require collaborative workspaces where students can work together and modular design to allow the classrooms to be reconfigured to accommodate the changing student body and curriculum for next 30 years. Skyline is the best school in the Greater Salt Lake Valley and the state. It was ranked #1 (2016) and #3 (2017). It attracts bright students from the neighborhood and from across the valley. Imagine how much better it would be if it had up-to-date facilities that provided students with the facility they need to succeed in the Digital Age. We are very proud to be Skyline Eagles. Future students should have the best educational experience that will help them be ready to meet the challenges as they graduate from high school and pursue higher education or a career. We need to rebuild Skyline High. The vote for the bonding is on the ballot for November. We appreciate your support. Kanishka Ragula and Vikrant Ragula are seniors at Skyline High School.